Urban Worm Girl, L3C - Worms ate my garbage! 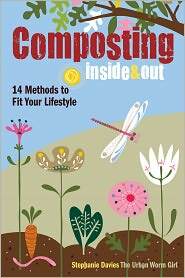 Begin your adventures in worm composting. Urban Worm Girl gives thanks to the hundreds of families, classrooms, and businesses that have adopted composting practices in the past years. Through their efforts, hundreds of tons of waste have been diverted from the commercial waste stream and converted into nutrient-rich soil with the help from a few hungry worms. Urban Worm Girl will no longer be offering products or services, but we invite you to review the Troubleshooting and Worm Menu pages to learn more about keeping your worms happy and healthy. It has been an honor to help so many people begin their composting adventures, and to know that we will all continue to do our part in helping to reduce waste.